Multigrain and wheat flakes with an oat, rye and seed cluster, pumpkin seeds, hazelnuts and almonds. Crunchy rice, wholewheat and barley flakes with freeze dried red fruits. Crunchy rice, wholewheat and barley flakes. Multigrain and wheat flakes with an oat, rye and seed cluster and freeze dried berries. Suitable for vegetarians. Halal - HFA Approved. 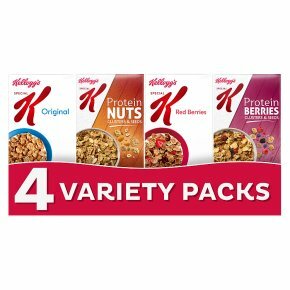 Special K Powering You* *A serving of Special K Cereals contains ?15% of the nutrient reference value of iron which contributes to the reduction of tiredness and fatigue.